Dunkerque’s LNG terminal and Grand Port Maritime de Dunkerque have signed an agreement for the development of an LNG supply station. The use of liquefied natural gas (LNG) by shipping and road vehicles has grown significantly in recent months with new projects (orders for ships, LNG supply stations, etc). Dunkerque-Port and Dunkerque LNG are convinced of the role that LNG will play both at sea and on land in reducing greenhouse gas and particle emissions. Dunkerque-Port and Dunkerque LNG have signed a partnership agreement for the development of a station to supply LNG to tank trucks. 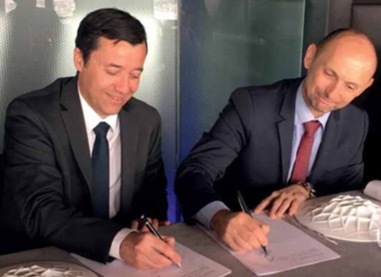 Under this agreement Dunkerque-Port will support Dunkerque LNG in its undertaking to build and then operate the supply station, as part of a larger project to set up an LNG provisioning service by land and sea in the port of Dunkirk, so making LNG available on the market. Dunkerque LNG SAS, the owner and operator of Dunkirk’s LNG terminal, is owned 65% by EDF, 25% by Fluxys (an independent group of natural gas transport infrastructures, based in Belgium and present throughout Europe) and 10% by Total. The terminal was commissioned on 1 January 2017 and has an annual regasification capacity of 13 billion cubic metres (corresponding to 20% of the annual consumption of natural gas in France and Belgium), which makes it the second-largest LNG terminal in continental Europe. It is also the only one to be connected to two markets: France and Belgium. The terminal’s operator is Gaz-Opale, owned 51% by Dunkerque LNG and 49% by Fluxys. The ninth port of the Channel and North Sea Range and France’s third-largest port, Dunkirk has built a reputation in many sectors: it is the largest passenger port in Europe (Calais-Dunkirk hub); the largest French port complex, with traffic of more than 90mt (million tonnes) via Calais-Dunkirk; France’s largest energy hub; the country’s largest LNG terminal; the leading French port for containerized fruit and vegetable imports; the largest French port for ore and coal imports; France’s largest rail port; the region’s largest waterway port; and the third-ranking French port for grain traffic. Dunkerque-Port is also a sustainable port. It is the trading port of the new Hauts-de-France Region, the largest agricultural region of France, the leading region for the rail industry, and the leading region for the car industry. Traffic in 2016 was 46.7mt.